Customize Your Master Lock 6327 Series Padlock! - Select Keying Option: Keyed Different (6327KD), Keyed Alike (6327KA), Master Keyed (6327MK), or Master Keyed & Keyed Alike (6327KAMK). - Select Bump Stop Option: Non-Bump Stop (Standard) or Bump Stop (N). - Delivery: The Master Lock 6327 Series Padlock is in stock and available to ship. See below for additional Delivery Information. Master Lock's Pro Series Solid Iron Shrouded padlocks are commercial graded and protected from cutting attacks by the solid iron shroud. The heavy steel body and hardened boron shackle protect against physical attack as well. The rekeyable cylinder can be swapped out in a matter of seconds, allowing this padlock to be used at multiple job sites or key systems. - Iron shroud protects shackle from bolt cutters. - ProSeries® Padlocks are designed for Commercial/Industrial applications. - 2-5/8" (67mm) heavy steel body withstands physical attack. - 7/16" (11mm) diameter hardened boron alloy shackle for maximum cut resistance. - Dual ball locking mechanism resists pulling and prying. - High security, rekeyable 5-pin cylinder with spool pins is virtually impossible to pick. Keying Option: Choose between Keyed Different (6327KD), Keyed Alike (6327KA), Master Keyed (6327MK), and Master Keyed & Keyed Alike (6327KAMK). All No. 6327 Padlocks come with 2 keys (all Master Keys are Sold Separate and available under "Related Items"). 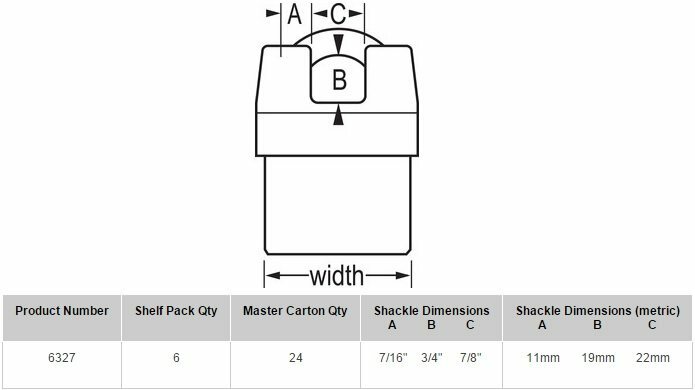 Shackle Option: Select Shackle Size -- 3/4" (Standard). Master Key: All No. 6327 Master Key padlocks (6327MK) will come with 2 keys but Master Keys are Sold Separate. Please Click here to order additional master keys, or order Master Keys through the above "Related Items" tab. Delivery: All Master Lock KA + KD (6327KA & KD) Padlocks are in stock in all shackle sizes. Please allow 2-week lead time for all Master Keyed padlocks. Special Ordering: If you require the No. 6327 Padlock keyed to an existing key number please leave a note in the Comments Box upon checkout (you can also immediately reply to the Confirmation E-mail with special order instructions).